Place the yoghurt, salt and lemon juice in a bowl and mix to combine. Transfer the mixture to a bowl lined with a double layer of muslin, gather up the edges to enclose and tie the top with string. Suspend the yoghurt from a shelf in the refrigerator, placing a bowl underneath to drain for a minimum of 24 hours or until the mixture is firm. Unwrap from the muslin, and store in an airtight container in the refrigerator for up to 3 days. Place all the marinade ingredients in a large bowl and combine. Add the lamb chops, and with clean hands, massage spices into the cutlets. Cover the bowl with cling wrap and leave to marinate in the fridge for at least 24 hours. The longer the cutlets marinate, the better the result. Preheat the oven to 160°C. Place the almonds, pumpkin, sunflower and sesame seeds in a small roasting dish, and toast in the oven for 10 minutes or until fragrant and golden brown. Remove from the oven and cool completely. Place all the ingredients into a food processor, and blitz into a coarse meal. Store in an airtight container until required. To Serve - Preheat the oven to 200°C. Preheat a chargrill pan or barbecue to high. Remove the cutlets from the marinade and fry in the chargrill pan, turning frequently and let the cutlets develop good caramelisation. Remove from the pan and place in the oven for 5 – 7 mins until just a little pink in the middle. Remove from the oven and rest for 5 minutes covered with foil. Place the savoury labne in a bowl, and add to a platter with the cooked cutlets and fried shallots. 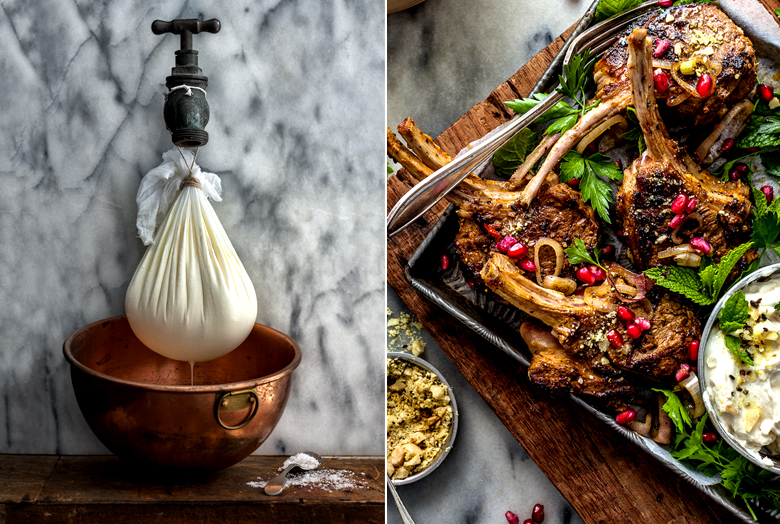 Scatter the cutlets with mint leaves, pomegranate seeds and dukkah. Drizzle with warm honey and serve with a green salad.